Today we begin a new section within “KRION® NEWS”, in which we will present the KRION® trial videos. These videos were recorded in the laboratory of our facilities. We do not just wish to present the properties of KRION®; in this case we want to compare it with other materials on the market that can be used in different sectors in which KRION®, the compact mineral from PORCELANOSA Group, can be shared. In no case do we wish to underestimate other materials, but instead position KRION® in its corresponding place. 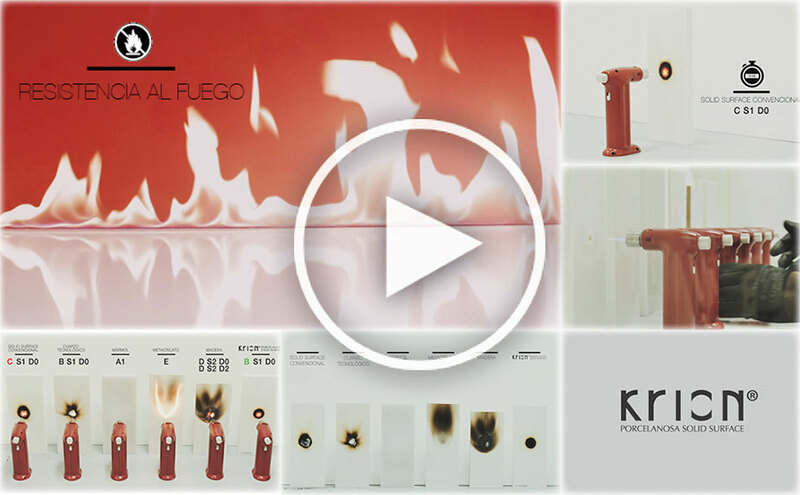 “Fire Resistance” – In this video we compare KRION®, with a conventional solid surface, Technological Quartz, marble, methacrylate and wood. As can be seen in the video, KRION® is less damaged by the flame of the blowtorch, and the only, along with the conventional solid surface, which allows us to regenerate the material; with the exception that our KRION® obtains European Class B-s1-d0 certification and a conventional solid surface obtains a lower level of C-s1-d0.